Not looking forward to Monday? According to a 2017 Gallop study, neither are nearly 70% of workers, including 60% of Millennials, who make up 38% of the workforce. Besides the obvious things: a perpetually cranky boss, low wages, long hours, and lack of opportunity, could the workplace environment deserve some of the blame? Aesthetics, functionality, and fun are important, especially for those of us who spend eight to ten hours every day in a 5-by-5 foot space. Fortunately, progressive companies are moving away from “cubes” and rethinking office workspaces for productivity, health, employee satisfaction. Employment trends show most workers desire full-time, flexible work hours and the ability to communicate remotely with their offices. While activity-based work can be productive, and Millennials, in particular, appreciate the independence, it isn’t possible for all job functions. Therefore, flexible workspace design, including allocation of how precious office space is used, is key. Paying attention to how work gets done, including access to technology and collaboration, can help office designers mimic the independence that “freelancers” desire. For example, one company created quiet zones, private spaces where employees could plug in and do intensive work without interruption. Another zone included collaborative workspaces that incorporated large square tables for team or creative design work. Each workspace contained audio and visual equipment for remote conferencing. Choice in how to do work helps all employees feel empowered. Because so many workers are now mobile and office space is expensive, some companies have done away with personal desks altogether and moved to shared desks like the 4,400 square foot “superdesk” at the Barbarian Group. Perhaps best introduced at start-up, the practice of “hot-desking” has mixed reviews at established companies, with one study reporting worker dissatisfaction, distrust, and distraction. Interestingly, the study describes a possible “emergent social structure” between “settlers” and “hot-deskers.” The takeaway here is that designing a workspace is not a unilateral endeavor. Employers should take into consideration demographics, office culture, and ways in which people like to work. Lighting. While the computer screen is a primary source of eyestrain, florescent lighting, window glare, shadowing, and flickering can also increase eye fatigue. Give some thought to visual ergonomics and new options in lighting design. Air Quality. Maintain air quality by the use of filters and air conditioning maintenance to reduce allergies and illness. Equipment. Make sure the right equipment is available – adjustable workstations including standing desks, wrist rests, anti-glare screens, document stands, and headsets. While implementing the fixes might seem expensive, attention to ergonomics has been proven to reduce absenteeism, turnover, and low morale. Work should also be fun. If you want to become one of the “cool” companies to work for, consider putting in a music room like LinkedIn and Google. 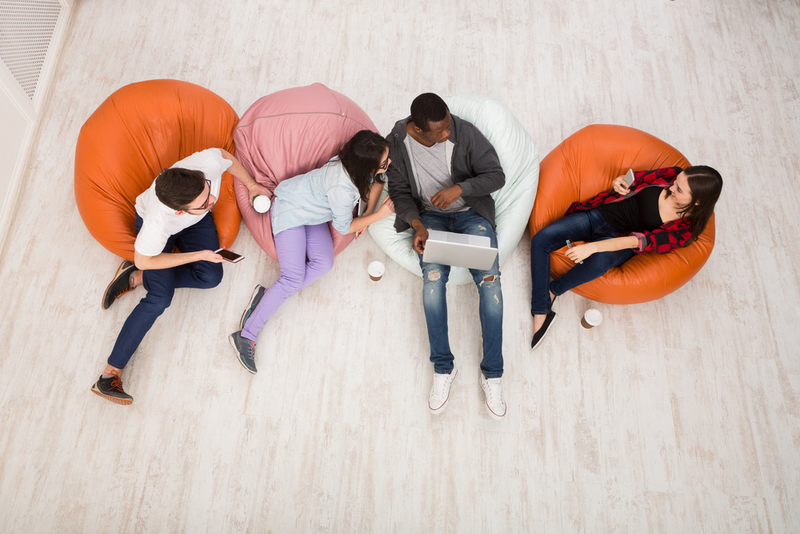 Theirs are high-tech studios including musical instruments and soundproofing for fun and stress-reduction, but a vacant office with a great sound system and comfy couches is a less expensive option to stimulate creativity and collaboration among employees who enjoy music while working. In Google’s Israel office, there is an indoor orange grove, complete with garden benches. But you don’t have to go that far. Installing an office garden space, either in an outdoor courtyard or in an office atrium, can inspire reflection and relaxation during the workday. Both natural lighting and plants have been shown to increase productivity. Besides reducing stress, live plants help eliminate harmful particulates like benzene and formaldehyde in office air, especially spider plants, Dracaena, ficus, and ferns. 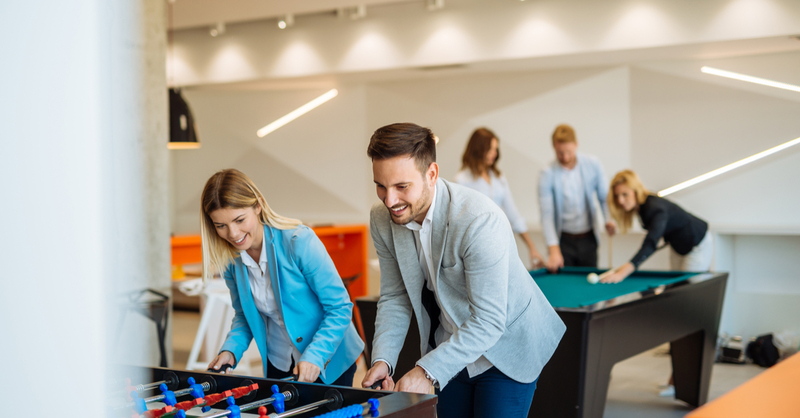 Treadmill desks, adaptable furniture, virtual reality rooms, and touch screen tables are also trending and particularly attractive to Millennial and Gen Z workers. So look around the office; if you see nothing but rows of cubes, desks, and zombies, perhaps it is time to check your workspace design and utilization and try something new!